The Super Bowl is this Sunday, so a dip recipe seems like an appropriate thing to post. I have three, really, but only one which photographed decently. If you want something really quick, and best served cold, let me recommend this cucumber ranch dip, which you can make with lactose-free sour cream. It is best served with ridged potato chips, but is also great with vegetables. If you prefer something warm, then I recommend this garlic and rosemary baked ricotta dip, which is almost a spread. It’s a bit more complicated only because you’ll need to make your own lactose-free ricotta; I recommend serving that one with thinly sliced baguette or something like Melba toast. 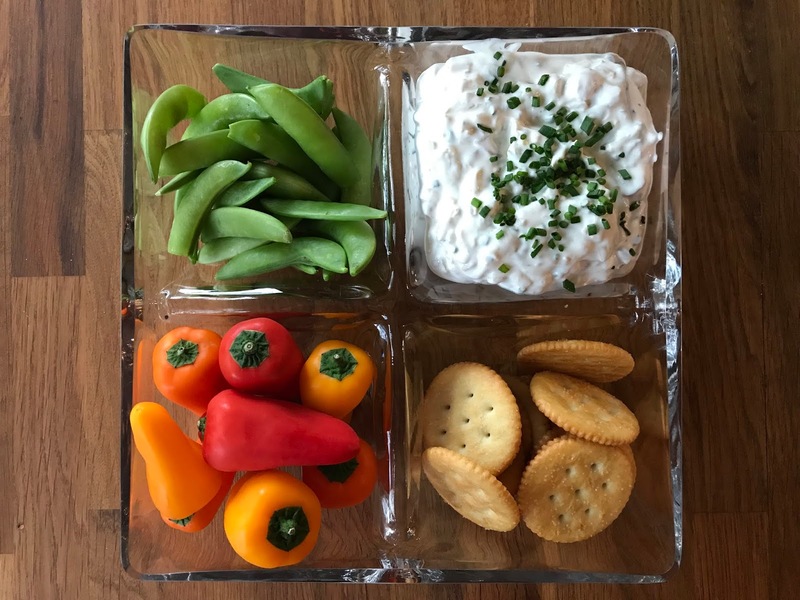 The third option is the middle ground: more work than the cucumber dip, but less than making ricotta; served at room temperature if you wish, or cold. 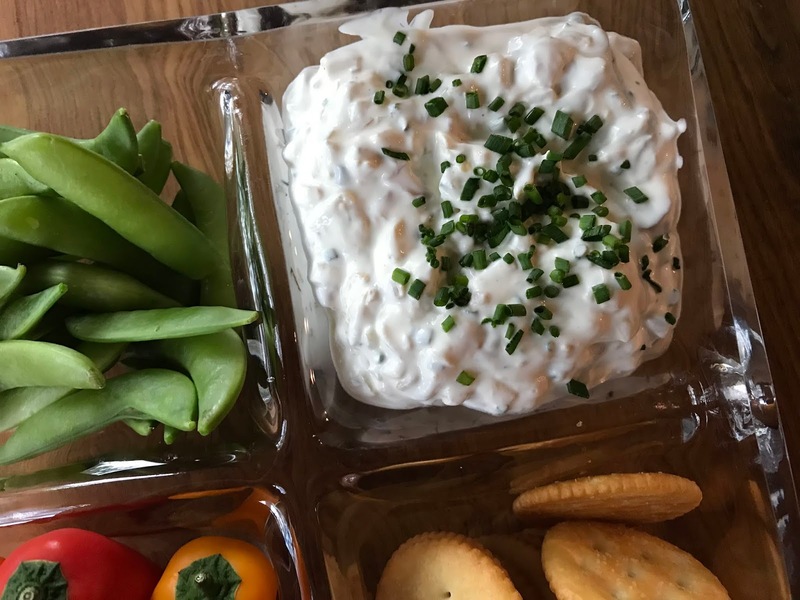 It’s an onion dip recipe from the February 2019 issue of Bon Appétit. The picture in the magazine had a Ritz cracker, and we have them so very rarely, but I decided to go for it (“treat yo’self” and all). I also served the dip with snap peas and adorable miniature bell peppers. For the record, the Engineer and the Little Prince were not fond of it (though the Little Prince was so impressed by the crunch of the bell peppers that he agreed to try one); the Fox and I liked the dip, though the Fox had a clear preference for crackers over vegetables. Heat olive oil in a small skillet over medium heat. Cook the onion, garlic, and thyme, stirring occasionally, until onion is deep golden brown and very soft, 35-40 minutes (take your time!). Discard thyme and let cool. Mix caramelized onion with the rest of the ingredients. Let sit 30 minutes before serving (I topped it with additional chives).